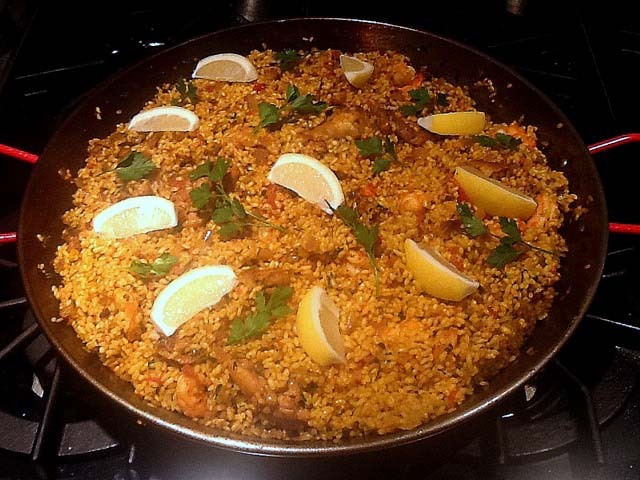 I served these last night and they were a HIT!!!! Don’t be afraid of scallops just remember to add them to a HOT pan and make sure you have patted them dry so the take on a “sear”. In a different pan, heat the other 2 TBS of olive oil and add the finely chopped red chili. Saute for about 40 seconds on a med-high heat, and then add in the scallops. Cook the scallops for about 40-45 seconds (yes that is the magic number in this cooking process…hahaha) and then turn over and do the same until they are golden brown. 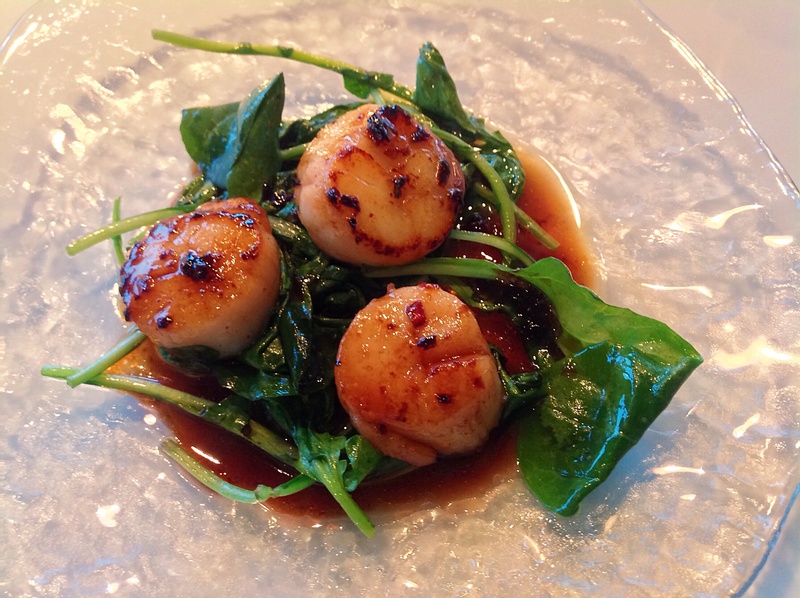 Arrange the arugula on plates, then top with either 2 or 3 scallops and then drizzle the Chili/Honey sauce on top and serve!!! Thank you Sweet Paul Blog for the idea!!! 1. Stir together maple syrup, soy sauce, Hoisin Sauce and Dijon mustard in a bowl until smooth. Add the scallops, and toss to coat. Cover bowl with plastic wrap, and marinate at least one hour. 2. Preheat oven to 375 degrees F (190 degrees C). Line a rimmed baking sheet with a sheet of aluminum foil. 3. Arrange bacon pieces on baking sheet so they do not overlap. Bake in preheated oven until some of the grease has rendered out of the bacon; the bacon should still be very soft and pliable, about 8 minutes. Remove bacon from the baking sheet and pat with paper towels to remove excess grease. Drain or wipe grease from the baking sheet. 4. 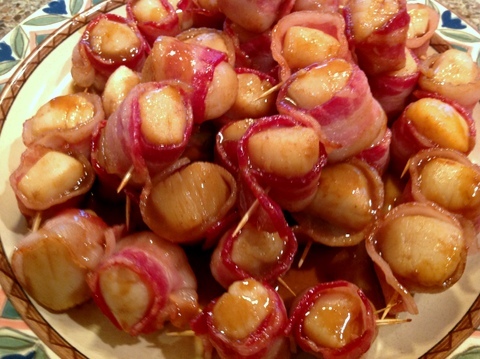 Wrap each scallop piece with a piece of bacon, and secure with a toothpick. Place onto baking sheet. Add marinade sauce to each scallop then put in oven. 5. Bake in preheated oven until the scallops are opaque and the bacon is crisp, 10 to 15 minutes, turning once. Heat a 10- or 12-inch nonstick skillet over medium-high heat for 1 to 2 minutes. Add the oil and butter, if using, and heat until quite hot. Pat the scallops dry once more and put them in the pan in a single, uncrowded layer. Season with salt and pepper and let sear undisturbed until one side is browned and crisp, 2 to 4 minutes. Using tongs, turn the scallops and sear until the second side is well browned and the scallops are almost firm to the touch, 2 to 4 minutes. 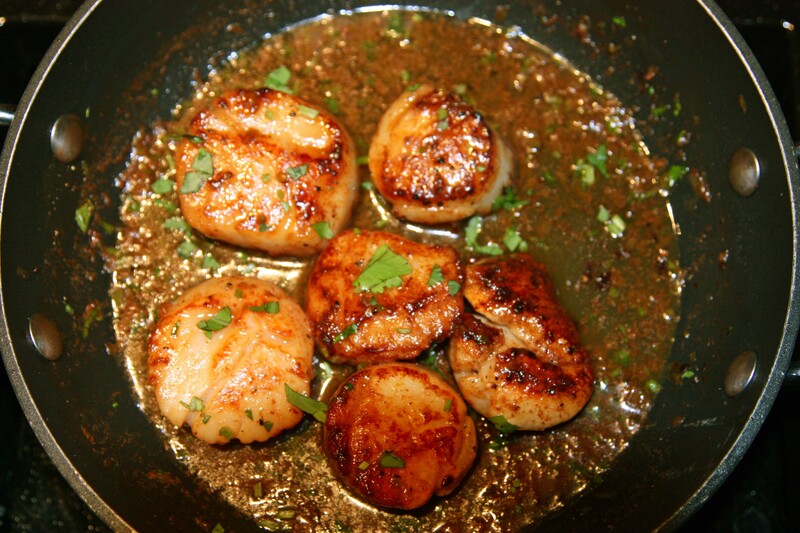 Take the pan off the heat, transfer the scallops to a plate, and set them in a warm spot. Let the pan cool for a minute before you make the sauce. Return the pan to medium heat. Add a piece of the butter (1/2 Tbs.) and the shallots and sauté until the shallots begin to soften, about 1 minute. Add the vermouth or wine and simmer until reduced by about half, another 1 to 2 minutes. Add the herbs and lemon zest. Reduce the heat to low, add the remaining butter, and whisk constantly until the butter melts into the sauce. Return the scallops and any accumulated juices to the pan. Gently roll the scallops in the sauce to warm them through. 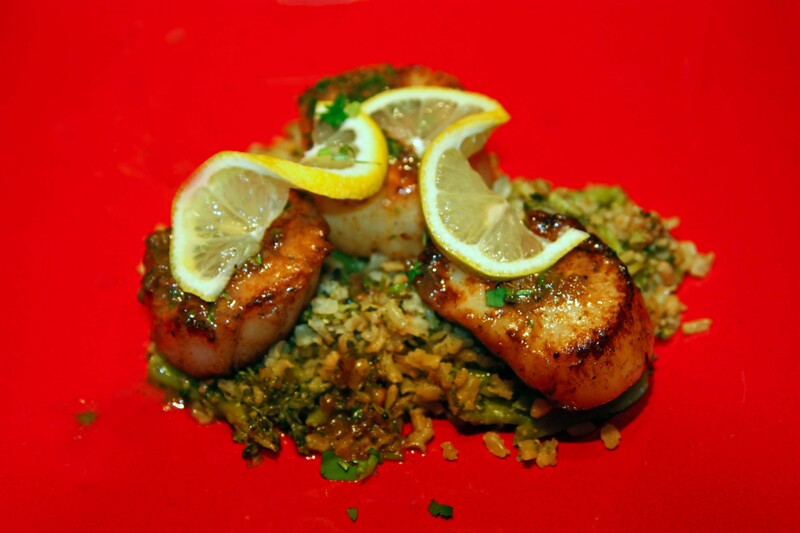 Taste for salt and pepper and serve immediately with lemon wedges on the side to squeeze over the scallops. Served this over herbed rice.